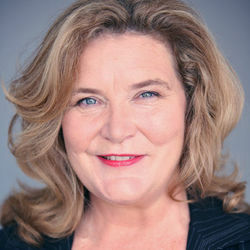 Sylvia Rands is an New Zealand actor, voice teacher and sound healer. When in Residency at Earthskin, she will be working on a book about her vocal methodology Four Elements Voice. She teaches this methodology in Drama Schools around Australasia and in public workshops. It has wide appeal as a holistic approach to Voice Training. Her book will also be an essential base for the Voice Teacher Training programme which she plan to offer in New Zealand in 2020. Alongside the writing she will be creating an online training, and a solo performance. 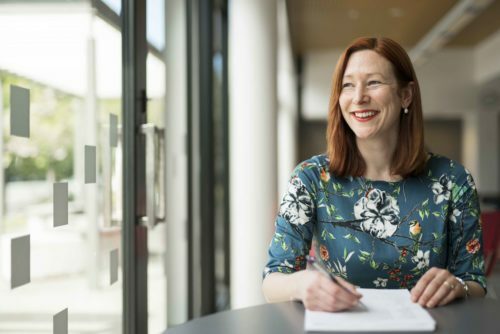 Dunedin-based writer Kathryn van Beek completed a Master’s degree at Victoria University’s Institute of Modern Letters and the Fiction Writing Course at The Creative Hub. 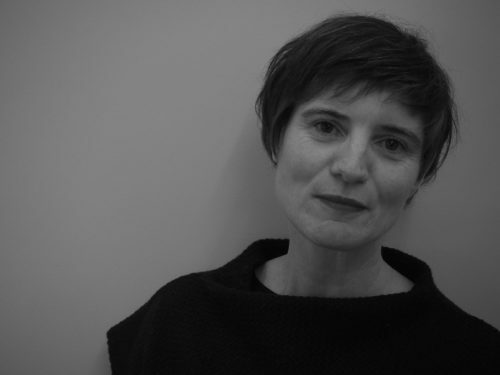 Her short stories have appeared in Headland, Hue and Cry, Pot Roast and Aerodrome, and she won the 2015 Headland Prize. She has also published several zines, and she won ‘Best of the Fest’ at Auckland Zinefest 2015. In February this year Kathryn published Bruce Finds A Home, an illustrated children’s book about her famous cat. Kathryn’s articles, essays and reviews have appeared in The Spinoff, The Sunday Star Times, The New Zealand Herald and more. Kathryn is the inaugural recipient of the Earthskin-Creative Hub residency. While in Muriwai Kathryn will work on short stories and personal essays, and continue to develop the second in her series of Bruce the Cat books. Practical tips for writing and publishing a children’s book, with Kathryn van Beek. 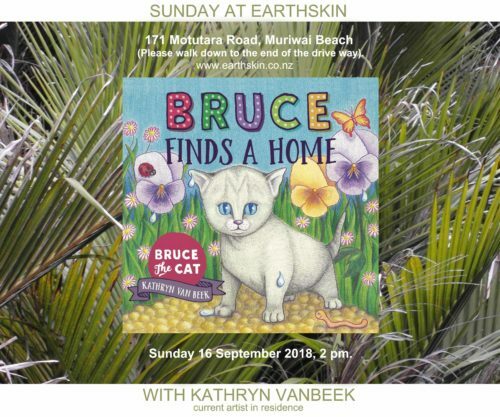 Join author / illustrator Kathryn van Beek as she recounts the process behind the publication of her children’s book ‘Bruce Finds A Home’, and shares practical writing and publishing tips. It will be held at Earthskin 171Motutara Road, Muriwai Beach, on Sunday 16 September 2018, 2 pm. Please walk down to the end of the drive way (exception can be made if required). Joe Joe Orangias is a visual artist, activist and writer from the US. 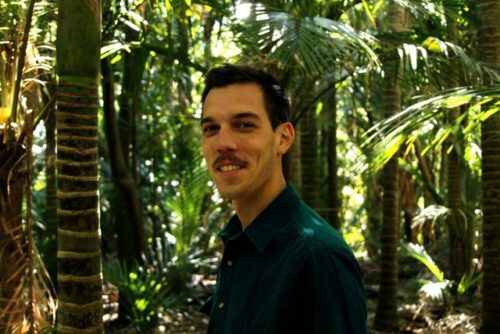 His projects, often collaborative and research-based, focus on social and environmental justice issues. 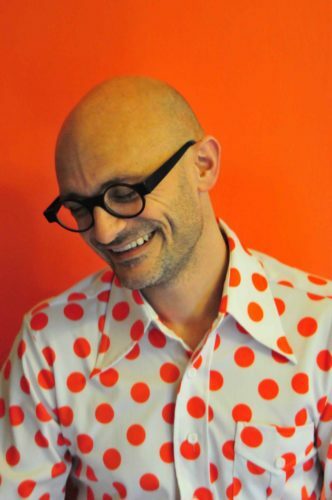 At the residency, he will continue developing his current embroidery and writing projects. He holds a MFA from the School of the Museum of Fine Arts, Boston at Tufts University. Orangias has exhibited work at the Pearce Gallery at Whitecliffe, Auckland; the Contemporary Arts Museum, Houston; the Cooper Hewitt-Smithsonian Design Museum, New York City; Hinterconti Projects, Hamburg; and the Jockey Club Creative Arts Centre, Hong Kong. 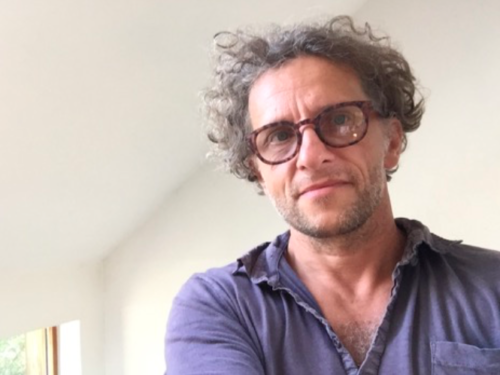 He was awarded a SMFA Alumni Traveling Fellowship for research in New Zealand; an Art School Alliance Fellowship from the Hochschule für bildende Künste-Hamburg in Germany; and residencies at Earthskin Creative Residency (Muriwai) and RM Gallery (Auckland). Orangias has published articles in the Journal of HomosexualityandScope: Contemporary Research Topics (Art: 11), a peer-reviewed journal of the Dunedin School of Art. Art & activism: A discussion on developing hybrid practices, withJoe Joe Orangias. Joe Joe Orangias will discuss how he integrates activism into his art practice. In Full Flowis a recent project consisting of mail art and a series of sculptures, which advocate for governments to implement more progressive national refugee policies. This project, which has been exhibited at Pearce Gallery (Auckland, New Zealand), Mills Gallery (Boston, US), JAVA Studios (Brooklyn, US), FLUCA – Austrian Cultural Pavilion (Plovdiv, Bulgaria) and A.P.A. Galéria (Budapest, Hungary), consists of legal research, letters mailed to national leaders, their responses and embroidered and painted protest sculptures. He will also discuss how activism informed the development of the Pink Dolphin Monumentproject during his residency at the Galveston Artist Residency. The discussion will continue with more general ideas of merging art and activism. (Image credits: Katharina Swoboda & Kamen Stoyanov). 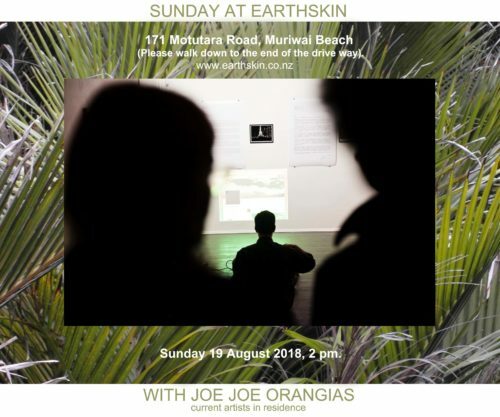 It will be held at Earthskin 171Motutara Road, Muriwai Beach, on Sunday 19 August 2018, 2 pm. Please walk down to the end of the drive way (exception can be made if required). Amanda Kemp is of Rongowhakaata decent and originally from Manutuke, Gisborne. she currently live at Muriwai Beach. She is a ceramicist and painter. She likes to work when possible with local clays and found objects. 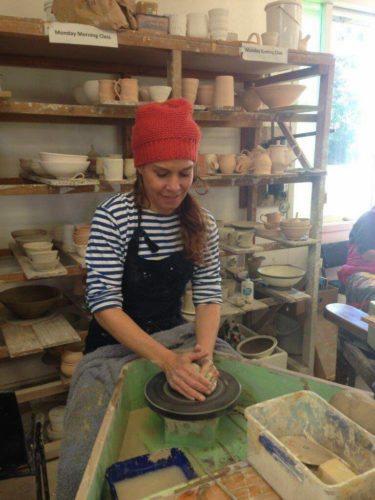 She will be making ceramic beads and hand built sculpture whilst at Piha. She will take some quiet time at the beginning of her stay and when ready shapes take form that will reflect my surroundings. She then plan to pit fire the made works with seaweed and driftwood from the beach. Charlotte Crichton is a mixed-media artist from New Zealand. As a mixed-media artist, she hopes to engage the viewer on an emotional level with the intention of awakening or contributing to, a sense of depth and meaning, hope and purpose, love and connection, between humanity, and the natural world. Neil Aldridge is a sound artist from New Zealand. With Charlotte Crichton & Neil Aldridge. 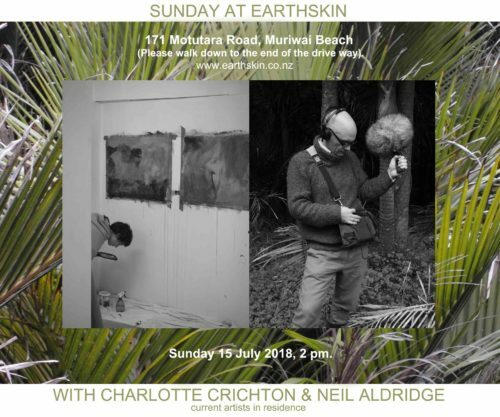 Neil will be presenting the sonic art project he has been working on, and giving a talk about the process of acquiring, composing, manipulating, and assembling it — using field recordings from India and Muriwai, and recordings of Indian singing bowls and the piano at Earthskin. Charlotte will be introducing her body of work — describing the concepts that drive it, explaining her processes, and plans for developing it further. It will be held at Earthskin 171Motutara Road, Muriwai Beach, on Sunday 15 July 2018, 2 pm. Please walk down to the end of the drive way (exception can be made if required). Martin Krammer is a Sculptor and Painter from Austria. Last time when he was at Earthskin, in early 2014, Martin made a piece that became the first in a series and kind of a role model for the work of the following years. It was the first free standing bas-relief he made, and many followed. This time Martin will be looking at driftwood. For him, any driftwood is a traveler. A traveler of a secret journey and foreign origin. He always work with wood, and in this case, it’s a substance that is charged with this mystery. Is there a similarity of the movement of the ocean and the process of making Art ? He likes the idea of describing the source of his work as a lock chamber of his subconscious. Doesn’t the sea do the same thing in washing up pieces with history from nature and civilization, disrupted of its context? In this sense he imagine the work during his residency to be a collaboration between nature and artistic input to create sculptures about the mystery of nature and any living existence. This mystery of life is his driving force! 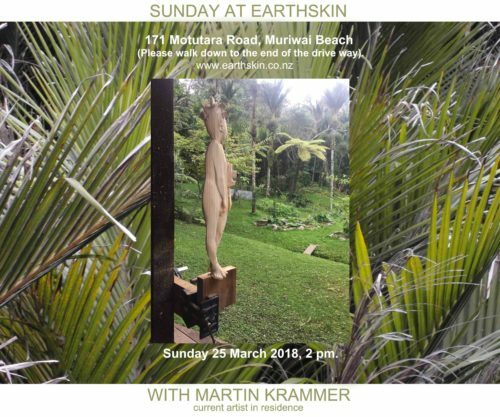 Everyone is welcome to join our monthly Sunday at Earthskin, March 25 with Martin Krammer. More info..
Work in progress – A free standing Bas-relief, with Martin Krammer. Martin Krammer will give a short introduction to his work in general, followed by a focus on the serie of the free standing Bas reliefs. This serie, which started at Earthskin 4 years ago, became like a centerpoint in his work. During this residency Martin also started with a figure like this. The figure shows a women likely from a pacific Island who is turning around to the viewer, but the viewer has also to follow the turn of different angles. Martin will give an insight in the work in progress and the technique he uses. It will be held at Earthskin, 171 Motutara Road, Muriwai Beach, on Sunday 25 March 2018, 2 pm. Please walk down to the end of the drive way (exception can be made if required). It would seem that the urge to write newsletters seems to move with the seasons. Solstice in New Zealand draws near, and the Goddess Of Summer Maruaroa o Raumati already draws her cloak of heat around us leaving the land dry, but us great full after a long wet winter. Before my father died he said “ I charge you with making a difference on this earth “. That weight hung around my shoulders till I examined the challenge – and came to the realisation that this is a shared call for humanity, we can’t do it alone. But together we can, and Earthskin provides a vehicle of enormous scope and vision of her own. I just need to make small magical incisions for a key to open large doors and let restoration of our earth pour through. In November this year a very special paper came to fruition. Under the care and funding from Earthskin and others, a new paper has been published in the journal “Microbiology” confirming for the first time that the active ingredients of the commonly used herbicides (Roundup, Kamba and 2,4-D, respectively) each alone cause antibibiotic resistance well below label application rates. Professor Jack Heinemann of The University of Canterbury New Zealand, and his team have demonstrated that they are undermining the use of antibiotics (more…). We are destroying and polluting our future world with man made substances. Thanks to these people brave enough to step forward as stewards of our life giving planet.